I have followed the work of Yanira Castro/a canary torsi ever since 2013, when I participated in early versions of “The People to Come,” a work that drew me in as I had never been drawn into a performance before. The piece took the audience and asked them to incorporate parts of their own stories into the dance,. This wasn’t just an immersive performance; we were being asked to co-create it. I was transfixed. In every a canary torsi piece, especially the magnificent “Court/Garden,” Castro has continued to redefine what it means to be part of a performance, for everyone from performer to audience. And from the audience, I never felt so essential to the creative process. Castro is a law unto herself. Her eclectic work knows few rules: it is both dance and performance; it incorporates dramatic trappings of sets and costume, careens between improvisation and rehearsed movement, builds structures and texts from wildly different sources, incorporates the audience, physical site and edgy stagecraft and sound into whatever she does. “The People to Come,” did all of those, inviting audience members to provide the source material – either an image, text, or movement phrase – online or in person. Performers used those sources to create, rehearse, and present individual creations for hours on end, as the people who came sat, wandered in and out, added new source material as they were inspired, in a spiral of ideas and interpretation. When I saw an early showing, I added a movement phrase (I actually taught my movement to performer Simon Courchel. Imagine that). On Martha’s Vineyard, where I sat through six hours of performance, I offered up a photograph of my recently deceased father to the work. And at The Invisible Dog, my contribution was a beloved line of poetry. I could see Simon interpret my movement; the photo and the poem were less visible – but I could find them if I looked. It mattered that I was one of the People who Came. Now Castro is, again, trying something new. Something, in fact, that hasn’t been done before. Over the course of two weeks in September, she will be presented by three New York performing arts organizations simultaneously, offering three connected but independent works to explore and illuminate the mysteries of “CAST, STAGE, AUTHOR.” The two performance pieces and one interactive installation were created in collaboration with 15 New York-based performers, as well as a contingent of collaborators in design, light, sound, costume, and mask-making. It is a brave, demanding undertaking, the kind of project that most would say “can’t be done.” Just right for Castro, and her colleagues. And one that will make new demands of all of us who play the role of audience member. Ideas are always percolating as Castro sees a picture or hears a phrase. First images emerge for her, then questions. And when she asks, the rest of us become the answer. Her choreography and art are explorations; her intention for the “CAST, STAGE, AUTHOR” triumvirate – about the elements of performance itself – is not to meet goals of her own aesthetic, but to create a “system” for exploration, and see what is created in that space between and among the performers and the audience. In experiencing her pieces, it has been both anxiety and excitement that engaged me – not whether my reaction is right or true, but how my contribution will change the outcome. Although “C/S/A” is made of three distinct works, it is also a linked whole, starting with the original research inspiring all the segments. The actual text of each iteration of “CAST” is built – Cage and Cunningham-like – on the random selection of an enormous archive of content generated by the dancers. The archive that Castro created is the heart of all three pieces, and was developed from in-depth interviews she conducted with fifteen New York City performers. It is a remarkable group, and I wondered how and why she selected them. It turns out that it was a mix of control and serendipity: she “asked a handful of artists, and asked each of them to invite a handful of artists.” In two four-hour conversations with all of them, she posed a series of questions about their own histories of performance, casts and productions they’d been part of that mattered to them, and then transcribed the interviews, as well as recording five hours of video of each person, performing. I know what it’s like to interview a subject, and how deeply invested I get in understanding that person. I can hear and see that dedication in this work, too. “CAST” is built around texts created from those interviews. The words of four different performers each night are searched using a computer algorithm, so the cast of a specific night performs its unique script, a “living archive,” to a new audience. I’ve seen moments of several of these casts, and listened to the strange monologues built by the algorithm from dancers’ histories. The gorgeous Iréne Hultman, a core Trisha Brown dancer, huffed through one of these on the live-cast teaser that Castro filmed for her Kickstarter campaign; that monologue (and the performer) could not have been more different than David Thomson, who led an early showing of “CAST” on the floor of the Chocolate Factory, wrapped in the ephemera of the performance. There are other rules in the system behind “CAST,” including a movement scene built on the performers’ memory and interpretation of an improvisation Castro created for them (her first dance, she divulges, in almost a decade, since the birth of her son.) This generative process also pushes into “AUTHOR” – the place where work is created. A computer game is at the heart of “AUTHOR,” not a performance. In the work, some of the audience members will be in direct conversation with the cast’s archive, through an interactive computer game, answering questions posed by the original texts and incorporating their own “authorship” into new texts. Not everyone will work on the computer (be an author), but the rest of the audience will receive the expanded text. Those who create dialogues with the computer – play the game – will have more insight into the control of authorship, but those who don’t play will – like most audiences – only see the work from the outside. I played “AUTHOR” in an early draft. In a quiet, empty space, I sat at a computer. A dialogue came up on the screen (and was projected onto the wall), asking me questions about my own experience with performance. As I “talked” with the computer (the texts randomly selected by an algorithm), I found I had a lot to say – the hardest part was ending when the arbitrary time limit cut me off. This was another artistic challenge – how and when to stop. Given Castro’s intense focus on collaborative creation, the exploration of what constitutes “authorship” takes on the qualities of an Escher drawing; anything can be a beginning or ending, and all paths are forms of artistry. Of the three works in the trilogy, “STAGE” is the work that Castro describes as the biggest mystery, and so far, has been most spare in details. She describes herself as “seducing and being seduced,” by image and what constitutes spectacle. I experienced that most powerfully in her “Court/Garden,” where the extraordinary imagery of the opening act was unforgettable – baroque bodysuits and gilded masks and the on-stage festooning of a queen in a royal robe of endless draped paper towels. 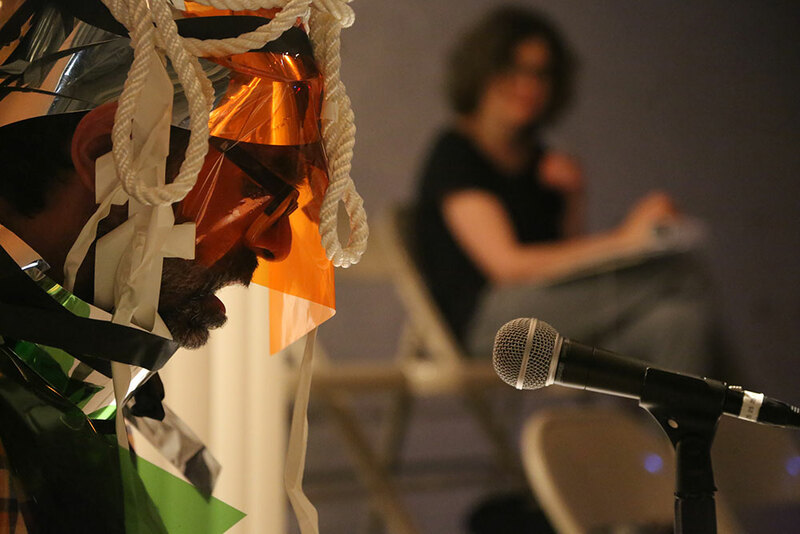 In an early workshop of “Court/Garden” in a big empty room on Governors’ Island, audience members milled around in various roles – and I became that queen. Bedecked in a gown of paper, Castro herself led me in a procession around a room filled with others who were engaged in their own roles. Each of us experienced the moment from our state – our own place in the cast of this workshop. Where “CAST” is the gift of the performers and “AUTHOR” shares the art-making with the audience, in “STAGE,” Castro wrestles with her own demons, the author’s continual struggle to control what the audience sees and experiences. She describes herself as being in her own “personal war,” a love/hate relationship with image-making. “STAGE” must be performed in a proscenium theater (a setting that Castro has not used before), separating the audience from the performers. The performers’ sweat and efforts are distant, hard to discover. Here, the performers grapple with their transformation, the crossing of that liminal space between their selves in the wings, and their selves in the moment when they emerge and are seen onstage. In these last few weeks before the opening, a group of interns are creating masks with Castro and the cast, building another route to transformation, as performers present with and without their literal and interior masks. Because spectacle itself is the fodder for STAGE, it is spectacle I’ll be looking for, curious to experience Castro’s work from a hard theater seat below and far away from the action. From my earliest engagement with her work, I have felt the itch of the questions Castro poses. Her works-in-process are truly that, and each rehearsal or workshop or showing has demanded that we both participate and embrace the reality that no performance will never be the same. Even choosing a night, or seeing all three in the same day, will matter. I am certain, already, that once won’t be enough.